Finally! 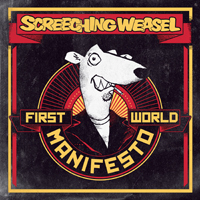 For the first time in 11 years, you can listen to a brand new Screeching Weasel song. Culled from the new album First World Manifesto, out March 15th, head over to Spin to download “Beginningless Vacation”. That’s not all. Ben Weasel was recently interviewed by the MTV Music Book Club about his favorite piece of literature. And of course Screeching Weasel is hitting the road throughout 2011, with announced stops in Texas, the East Coast, and the Screeching Weasel 25th Anniversary weekend in Chicago. More dates to come!